Titanium « Global Market Insights, Inc. Additive manufacturing with metal powders market has observed an appreciable expansion in recent years, essentially pertaining to the fact that the technique helps to build convoluted components that were earlier considered difficult to construct. Today, additive manufacturing has moved beyond the conventional prototyping technology, which has indeed acted as a major driving force for additive manufacturing with metal powders industry growth. Not to mention, the deployment of this technology has led to effective production of components that are now massively demanded across the aerospace, automotive, and medical sectors. The material spectrum of additive manufacturing with metal powders market is rather extensive and encompasses quite a substantial number of metals and alloys. 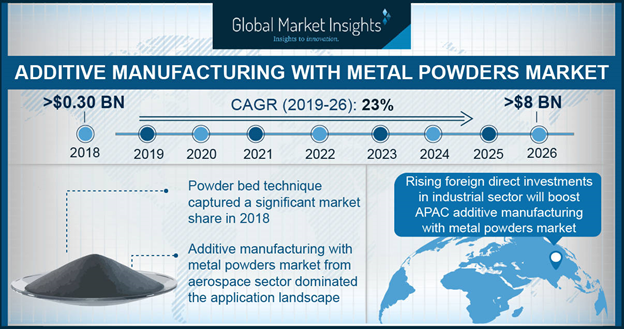 With robust rise in the number of procedures for additive manufacturing, more and more constituent metals are being involved in the manufacturing process, thereby expanding the material landscape of additive manufacturing with metal powders industry. The most common metal powders used for additive manufacturing are aluminum, stainless steel, cobalt, nickel and titanium alloys. Titanium among these is known to register an exorbitant demand, driven by its formability, light weight, superior strength and corrosion resistance. In fact, estimates claim that titanium alloy based additive manufacturing with metal powders market size will grow at a phenomenal CAGR of 29% over 2017-2024, subject to the material’s extensive deployment in the aerospace industry. Stainless steel has been touted as another product that is slated to witness potential growth in the additive manufacturing with metal powders market. This growth can be primarily credited to the material’s ferritic microstructure that makes it corrosion resistant and delivers superior mechanical properties to stainless steel, deeming it prefect for automobile parts, kitchen equipment and industrial appliances. 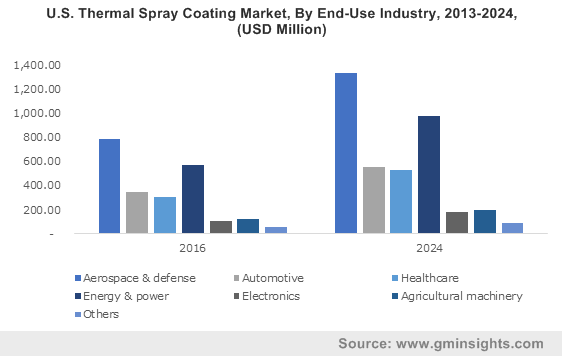 Fueled by its massive application spectrum, stainless steel based additive manufacturing with metal powders industry size is projected to register a valuation of around USD 240 million by 2024. Though additive manufacturing started out as an effective means for modelling and prototyping, additive manufacturing with metal powders industry has now experienced commendable expansion, subsequently leading to the application of the technique in a plethora of sectors. Industrial domains such as medical, dental, aerospace, automotive, jewelry, furniture, and architecture have been experiencing a touch of 3D printing techniques, while companies partaking in additive manufacturing with metal powders industry have been vying with one another to innovate varied products. The automotive sector is a prominent end-use domain witnessing the deployment of additive manufacturing. As the demand for lightweight parts has been increasing due to the rising need to curb carbon emissions, auto parts manufactured through 3D printing are being preferred over conventionally manufactured parts. 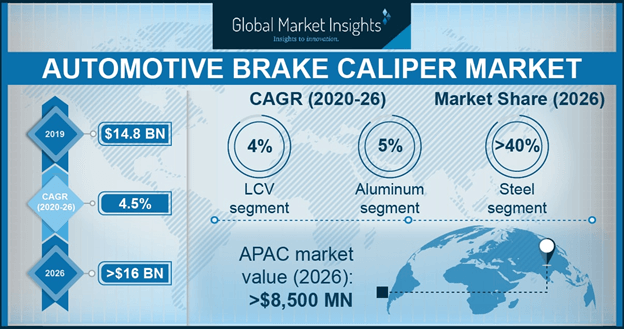 In response, additive manufacturing with metal powders market will witness a CAGR of 25% from automotive applications, over 2017-2024. One of the chief advantages of additive manufacturing is that it is produced directly from a CAD model, owing to which it is extremely flexible and subsequently finds major applications in highly individualized processes such as dental restorations. Not to mention, the technique’s versatility has led to its deployment in numerous other medical applications. It comes as no surprise therefore, that additive manufacturing with metal powders industry size from medical application is projected to reach USD 200 million by 2024, given that the process would help speed up production time without inflating the costs. Additive manufacturing is potent enough to be considered as one of the disruptive technologies that can change the entire landscape for design and manufacturing. From artists and designers to huge enterprises, the adoption of additive manufacturing is indeed witnessing a major ascent. In consequence, additive manufacturing with metal powders industry outlook has been observing a positive change of sorts. As the future of components is set to focus on the design for function rather than design for manufacturing, additive manufacturing with metal powders market size is undeniably slated to witness phenomenal growth between 2017 and 2024, with a target estimation of 4.5 kilo tons by 2024, in terms of volume. This entry was posted in Automotive & Transportation and tagged Additive Manufacturing with Metal Powders Market, Additive Manufacturing with Metal Powders Market Forecast, Additive Manufacturing with Metal Powders Market Report, Additive Manufacturing with Metal Powders Market Share, Alloy, Aluminum, Austenitic Steel, Blown Powder, Cobalt, Copper, Direct Metal Deposition, Direct Metal Laser Sintering, Duplex Steel, Electron Beam Melting, Ferritic Steel, High Speed Steel, Laser Engineering Net Shape, Low Alloy Steel, Martensitic Steel, Nickel, Powder Bed, Precious Metal, Selective Laser Melting, Stainless Steel, Titanium, Tool Steel.